I receive 2-3 emails per day asking about the Kaleidoscope House. Most of the questions are either about me selling the one I own (No, I like it and want to keep it), knowing where one can be obtained (Only eBay that I know of) or if the structure is quality (Yes, for a plastic dollhouse. Note: You are lucky if you get one of the houses that do not have the warped blue roofs. Unfortunately there was a batch distributed with the warped roofs. You see these on eBay all of the time. You know it’s a warped roof when it won’t snap down flesh to the structure. I was a recipient of one of the houses with a warped roof, but replaced it when I received a new one compliments of Larry Mangel back in 2001 or 2002. Since Bozart is no longer in business, I doubt this is a current option). I recently got an email asking which of the bedroom sets for the Kaleidoscope House were rare. You’ll remember that there are two versions that were sold: the one with the bed frame and plaid headboard and the one issued with the “box spring” mattress. In all honesty, I am not sure which of the two is considered “rare” but my guess is the one with the plaid headboard would have had less units circulating in the market since it was the first version of the bedroom set. Does anyone know for certain? Looking at the pictures above, you can see a reason why they would issue a second version. 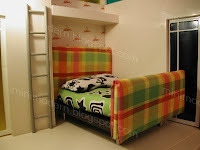 The bed with the plaid headboard doesn’t fit very well in the room’s dimensions. The Kaleidoscope House does appear to have had several different bed prototypes. See pictures below. 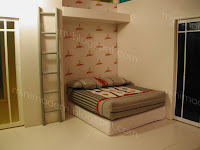 Also note the ladder to the sleeping loft and the opened version of The Big Idea. First, I want to thank you for your notes about Kaleidoscope House. Second, I would like to know if it's possible to get more information about this house we don't really know in France. Which is the concept ? Who imagined this house ? Where do the fourniture come from ? Is it your creation or do you get accessories from differents dollhouses stores ? And what about its dimensions in cm, its scale ? Is it like Lundby House ? Thank you for your site I recently discovered. Thank you for your answers. I'm waiting for other pictures !!! I've got many dollhouses, but no contemporany. I'd like to get one soon, but I've to draw its plans ! I use both the Kaleidoscope House accessories and other pieces from dollhouse stores, action figures and candy toy companies mostly. I only make a few pieces. I prefer ready-made items. The structure is 1:12 (1 inch equals 1 foot). Is that 2.5cm = 30.5cm?? Sorry that my centimeter skills are subpar. It is larger than Lundby scale. Thanks for the information on why my roof doesn't connect properly! I don't know. Depends on where you live. I live in Chicago and I know that I have never seen the plaid headboard version before. I didn't know that it existed. On ebay, all I see is the stacked mattress version. About the BOZART living room set...I bought one on ebay, but it did not come in the box. This is the white sectional couch with white topped wire table and it also came with a modern-patterned rug. The cushions attach with velcro and there are "made in China" stickers on the bottoms of both couches. There is also some yellow glue that is showing through on the sides. I feel like I got ripped off, but did not have anything to compare it to. the seller said she bought it at the Toy Hut, an online retailer, three years ago, but did not keep the box. She assures me it is BOZART. She did offer a refund. I can send you photos if you're up for a little detective work. Thanks! I SAW this couch on ebay and was also suspicious. I've never seen the glue looking that way on one of the Jasper Morrison couches or any other of the Bozart mini pieces. I wondered about it. I'm not sure if you were ripped off. I do wish I had time for detective work (because it's interesting about that piece)but the working parent thing doesn't give me time to put on my Sherlock Holmes gear. Perhaps someone else out there knows more about this? Does anyone have the directions for the Kaleidoscope House? I would like to purchase a copy.